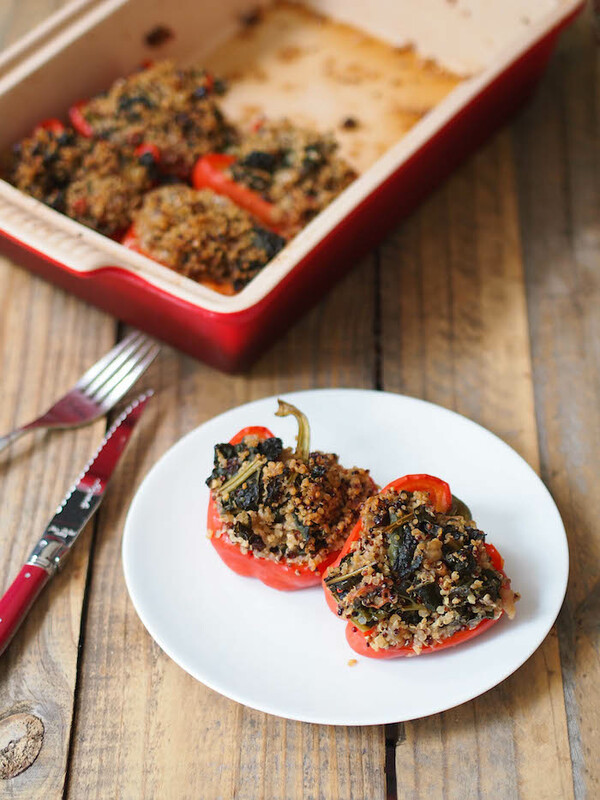 These stuffed peppers are filled with a vegan mix of quinoa, kale and Middle Eastern spices. 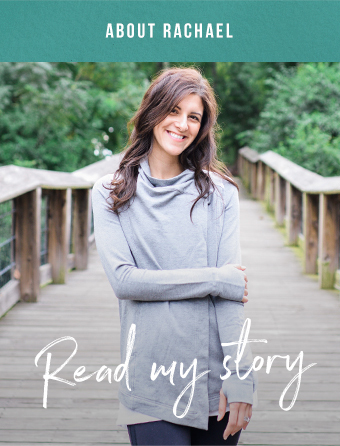 Earlier this year, my husband and I cancelled cable and started streaming shows instead. It was a pretty fantastic decision. Besides saving money, we have the freedom to watch any season of all our favorite shows at any time of the day. If I want to watch seasons 1-7 of 30 Rock, I can. If I want to watch that episode of the X-Files where the parasitic Siamese twin of a circus act can detach from his body and eat other people, I can. And if I feel like watching nothing but documentaries and TED talks for a week, I can do that too. Technology is awesome. The only thing I miss about cable? The commercials. Err, the good ones at least. It was just the other day that I finally saw the Bud Light quinoa commercial and I just about fell off my chair laughing. The look on that guys face as he proudly pronounces “it’s a qween-o” is classic! Despite the funny name, quinoa isn't as weird as as it sounds. 'KEEN-wah' is an ancient South American grain whose cultivation can be dated back to 3000 BC. It was a staple crop of the Incas, along with potatoes and corn. At one point, they were growing over 250 different varieties, but after the Spanish conquest, quinoa all but disappeared. You see, the Spanish, shocked at the Inca’s ability to put up a good fight, despite the fact that they had no guns or horses, assumed it was quinoa that gave them their strength. Fearful of an Inca coup, they banished its cultivation. Maybe they were on to something! It certainly is a nutrition powerhouse! Although we eat quinoa as a grain, it’s technically a seed of a plant in the same family as spinach, chard, and beets. Being a seed, it contains more fat and protein than other grains. Half a cup of quinoa contains 12 grams of protein, making it perfect for meatless meals. Because quinoa is higher in fat, it's also a rich source of fat soluble vitamins like vitamin E and even contains small amounts of omega 3 fats. It contains a hefty dose of phytonutrients – quercetin, kaemphferol, vanillic acid, coumaric, two of which (flavonoids quercetin and kaemphferol in case you were wondering) are so concentrated in quinoa, some varieties actually contain more than berries, a food usually touted as the top source of flavonoids. Mix cooked quinoa into veggie patties where it adds a meaty texture. My favorite was a black-eyed pea and quinoa cake I made for New Years, but I just pinned this recipe and I have a feeling it might come out on top! If you’re bored of your standard oatmeal, make quinoa porridge for breakfast. If you’re cooking a dish with quinoa, make a little extra then heat it up in a pot with almond milk and drizzle with honey or pure maple syrup. Garnish with toasted nuts, chopped fresh fruit and cinnamon. Quinoa, with it’s satiating protein and fat and chewy texture, makes it a perfect salad topping. Quinoa is a perfect stand-in for rice in comfort food casseroles. Broccoli and cheddar quinoa casserole? Chicken enchilada quinoa bake? Yes please! My favorite simple, no fail, always satisfying weeknight dinner - sauté veggies in a flavorful sauce and serve over a bed of quinoa. Top with toasted walnuts and feta or goat cheese. Dinner in less than 30 minutes! Preheat the oven to 350 degrees. Toast coriander, cumin, and fennel seeds in a small pan over medium heat, or pop them in the toaster oven for a few minutes, until fragrant. Transfer to a spice grinder with the red pepper flakes. Process until powdered then stir in cinnamon. Heat 3 tablespoons olive oil in a medium saucepan on medium heat. Add onion, garlic, 1 teaspoon salt, and chile. Cook, stirring occasionally, until onion is translucent, about 5 minutes. Add chopped tomatoes and cook until most of the liquid has evaporated, about 3 minutes. Mix in the spices and cook for about 30 seconds. Add the quinoa to the pot. Stir to coat. Pour in 1 1/4 cup water, bring to a boil, then reduce to a simmer. Cover and cook about 10-12 minutes. Add kale. Stir and cook until wilted about 2-4 minutes. While the quinoa is cooking, place the currants or raisins in a small bowl with the orange juice and let stand for 15 minutes. After the quinoa has cooked, stir in the soaked currants or raisins, juice and nuts. Season with salt and black pepper. Place the pepper halves in a large baking dish. Divide the quinoa mixture between each half, mounding slightly. Pour about 1/2 cup water into the baking dish. Cover the dish with foil and bake until the peppers are tender, 40-50 minutes, and serve.